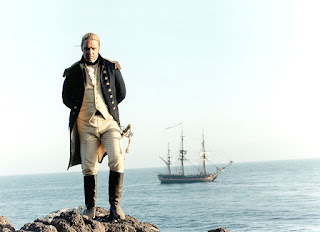 The Pirate Empire: What’s Wrong With Master and Commander? 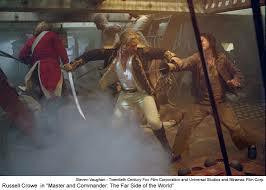 Since I have strongly recommended the movie Master and Commander: The Far Side of the World” the as research for Golden Age pirate lovers, you may be thinking you’ve found a treasure trove, and you should follow ever detail. The movie, starring Russel Crowe, and the books by Patrick O'Brian, have won acclaim. And they're about sailing ships! How much more relevant to pirates can you get? That isn’t the case, unfortunately. The movie – and the many books – are wonderful, but they fall into a category that makes them much less useful to us. They are set almost exactly 100 years too late. O’Brian’s masterwork, like many – or even most – stories of sea-going adventure, is set during the Napoleonic Wars. When I first found these books 10 years ago I didn’t care much about that little detail. After all, they were sailing ships, with masts, and lots of white canvas sails. How different could they be? About as different as a Model T Ford and a modern Lexis. Let’s look at some basic facts. The Queen Anne’s Revenge, the pirate ship that terrified merchants from Boston to Jamaica, and nearly stopped all commerce in the Caribbean. She was considered an enormous vessel, 103 feet long, 36 feet wide, rated at 300 tons, carrying 40 guns and harboring a crew of about 125 pirates. 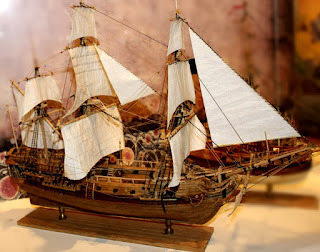 Model of the Queen Anne's Revenge - notice how much rope. 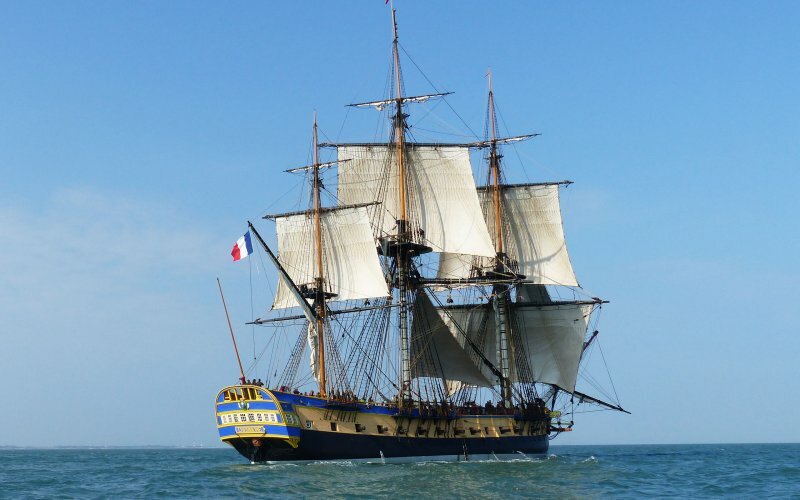 In contrast, the standard battle ship of the Napoleonic wars was the “74”. These ships averaged 180 feet long and 46 feet wide, and rated 2,000 to 3,000 tons. The “74” stood for the number of cannons. 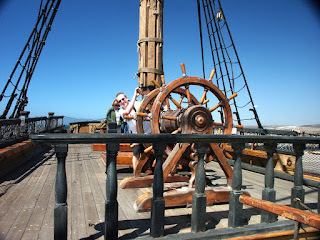 Crews regularly included 700 men.This made the navy ship of the later era 10 times as big as the most fearsome pirate vessel of all times, with nearly twice the armament. Large navy ships might carry as many as 110 guns. Replica of Hermione from the Napoleonic era. Rope, lost of rope. Speed developed, too. At about 1700, the average speed for many ships was 6 knots (about 6 ½ miles per hour) but by the early 1800’s, average speeds were nearly double, and some ships reached speeds of 20 knots (23 mph). For reference, Modern oil tankers generally cannot exceed 16 knots in speed. Part of this was achieved through improved hull design, some of it through more advanced sail plans. Ships from the 1700’s carried and used a lot of rope. 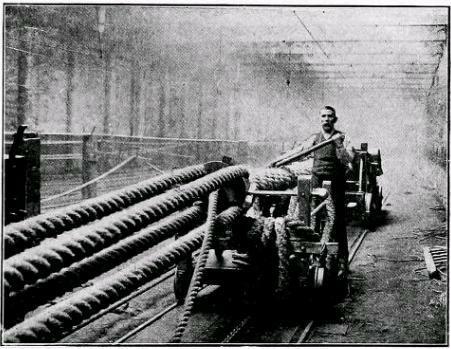 But by the 1800’s, rope work was literally so highly developed that it was accomplishing things that we do today with electronics. The Royal Navy of the Napoleonic wars had vast sources of supply, and used every type of rope imaginable – left hand twists, right hand twists, a variety of materials, thicknesses ranging from string to ropes as thick as a man’s waist. In addition, the war caused a vast rush toward standardization. 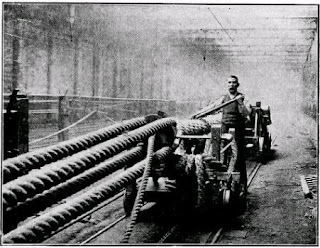 The navy needed tools, barrels, guns, and ship supplies, and they ordered them by the thousands. Businesses arose to make one thing – for instance blocks. 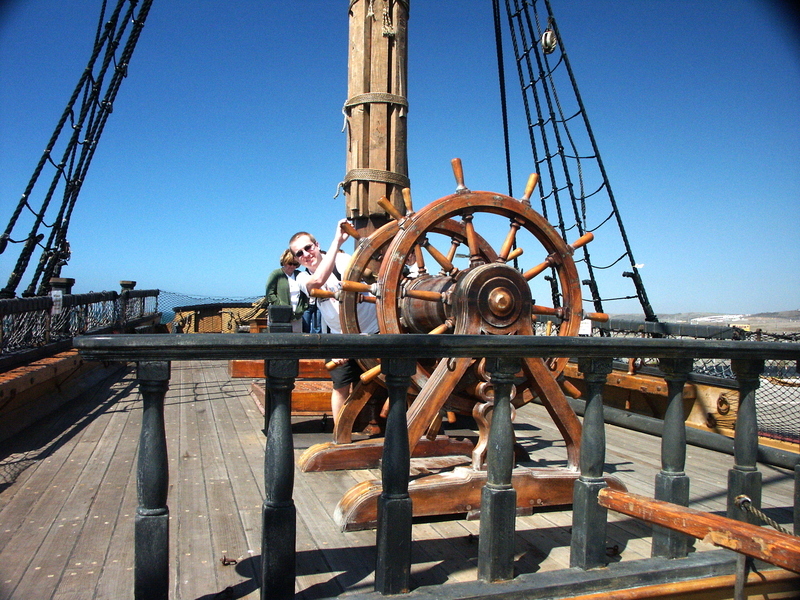 During the Age of Piracy, every item on a ship was probably hand crafted by a jack-of-all-trades carpenter. In the Age of the Navy, almost every item was mass-produced. Furthermore, trade had changed considerably. 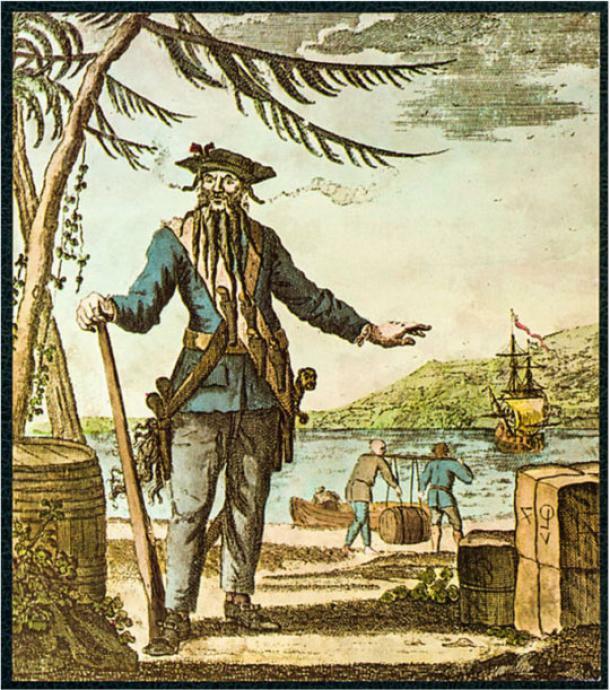 During the Golden Age of Piracy, merchant vessels did not have regular trade routes. Merchant captains scraped together a cargo, and then transported it wherever they could make a profit. Often ships sat in port for weeks or months, while the captain tried to put together enough goods for a profitable voyage. In the meantime, the sailors loitered in the port city, unpaid, getting into trouble. Bored, unemployed sailors supported apprentices who were fighting for improved rights, participated in labor riots, and often ended up in jail. 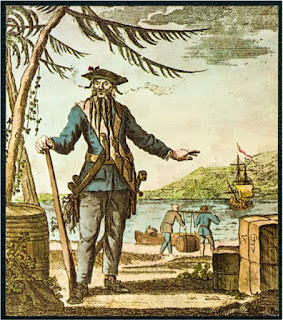 Communities, in turn, took steps to control sailors while they were on shore, and this led to resentments which drove some men toward piracy. By the Napoleonic wars, trade routes were much more regular. Ships were too valuable to be allowed to stand idle. Port cities in North America and the Caribbean expected ships to come regularly. Infrastructure such as warehouses, docks and shipyards had grown tremendously in the New World. During the Golden Age, Caribbean and the Americas were still wilderness. And while the area could not be called “tame” during the early 1800’s, it was, well, closer to that state. still used this more primitive steering mechanism. So – watch this wonderful movie, read these wonderful books. Learn a lot. Just be aware that what you are learning is only slightly related to Piracy’s Golden Age.